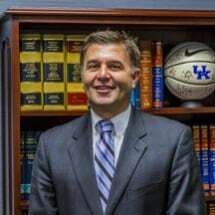 R. Craig Reinhardt, born in Glasgow, Kentucky, on September 27, 1960; admitted to the bar 1985, Kentucky; 1986 admitted to U.S. District Court, Eastern and Western Districts of Kentucky. Mr. Reinhardt is a graduate of the University of Kentucky College of Business and Economics (1982) and the University of Kentucky College of Law (1985). He is a member of the Fayette County, Kentucky and American Bar Associations, the Kentucky Defense Counsel (President, 2005-2006) and the Defense Research Institute. Reported cases include: Estate of Wheeler v. Veal Realtors and Auctioneers, 997 S.W.2d 497 (Ky. App., 1999); Elkins v. Kentucky Farm Bureau Mutual Insurance Company, 844 S.W.2d 423 (Ky. App., 1992); Kentucky Farm Bureau Mutual Insurance Company v. McKinney, 831 S.W.2d 164 (Ky., 1991); Jones v. Hanna, Ky. App., 814 S.W.2d 187 (1991); Peak v. Barlow Homes, Inc., 765 S.W.2d 577 (Ky. App., 1988); Swinebroad Denton, Inc., v. Hornback, 744 S.W.2d 429 (Ky. App., 1987); Murphy v. Kentucky Farm Bureau Mutual Insurance Company, 116 S.W.2d 500 (Ky. App., 2002). Mr. Reinhardt practices primarily in insurance defense, personal injury, products liability and civil litigation.